YouTuber PewDiePie has more subscribers than anyone else on the network, and some of his rabid fans have released at least two ransomware strains that encrypt hard drives and display a notice that informs victims that a decryption key will be made available only when PewDiePie's account gets 100 million subscribers. 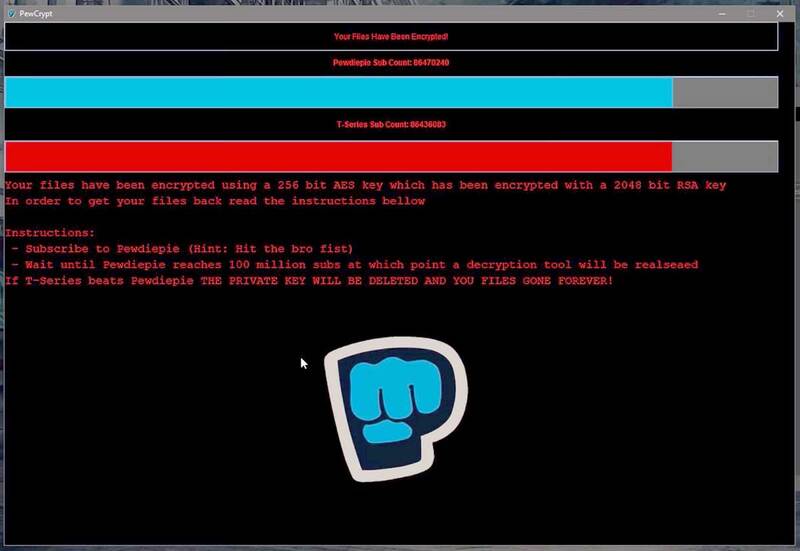 One of the ransomware strains also warned victims that if, at any time, the Indian Bollywood channel T-Series gets more subscribers than PewDiePie, the decryption key will not be released. Its author eventually realized the world of trouble he'd get into if any of those victims filed complaints with authorities, and released the ransomware's source code on GitHub, along with a command-line-based decryption tool. Yesterday, the team at Emsisoft released their own decrypter app based on these two tools, meaning victims can recover files without having to wait months until PewDiePie reached 100 million subscribers. Both ransomware strains show the level of idiocy the competition for YouTube's top spot has reached. While T-Series fans have remained mostly quiet most of this time, a portion of PewDiePie's fans appears to have lost their minds and engaged in media stunts bordering on criminal behavior. They've defaced sites, taken over printers, and hijacked thousands of Chromecasts and smart TVs to spew out messages of support and the now-classical "subscribe to PewDiePie." The message itself has become a meme, and not in a good way. White supremacy groups have adopted it as a chant, signifying a message of support of the "white race" in competition with the Indian "browns," represented by India's T-Series channel. A coalition of shipping industry associations has published The Guidelines on Cyber Security Onboard Ships, laying out best practices for the giant ships that ply the seas, and revealing that these behemoths are routinely infected with worms, ransomware, and malware spread by infected USB devices.